Ashley Barnes insists that the Clarets can’t afford to go in to their Premier League clash against Sunderland with any sense of entitlement. Burnley have beaten the Black Cats twice this term already with Andre Gray’s hat-trick securing a 4-1 victory in the league before the striker scored alongside Sam Vokes to settle the FA Cup third round replay at Turf Moor. David Moyes’s men sit bottom of the pecking order in the top flight, securing maximum points just once in their last 10 outings. However, the goalscorer of the game’s opener at Anfield last weekend knows that they’ll face a tough test at the Stadium of Light with the hosts fighting for their lives. “It couldn’t be tougher than this,” he said. “They’re fighting for their lives and so are we so it’s going to be a massive game. “What happened at our place, it’s not going to be that easy, so we’ve got to be switched on. 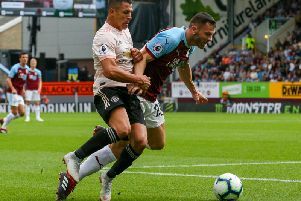 Sean Dyche’s side suffered a cruel blow in Merseyside, with Georginio Wijnaldum and Emre Can cancelling out Barnes’s opener, but the striker claims that positives can be pulled from the performance. “The equaliser changes the game massively,” he said. “I don’t know why it happens but we need to be switched on for 45 minutes plus. With the Clarets picking up just two points from their last five fixtures the gap separating the club from the division’s bottom three has been closed to seven points. And Barnes is determined to get that first away win chalked off to polish their position in the hierarchy. Heading in to the final 10 games of the season, Barnes said: “It’s going to be a nice relief and for the fans, but we just need to keep picking up as many points as possible to stay in this division. “Everyone is closing in with the points tally now but we need to concentrate on ourselves and take it one game at a time. “It’s not in the back of our minds. The hype of not winning on the road comes from the outside but it will change. Barnes added: “ The luck will change for us if we keep performing against sides like we have done. “Sometimes you have to win ugly and we need to make sure we come away with the points.